Another event is almost done so its time for a little review again! 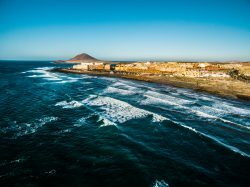 After the PWA in Fuerteventura it was time to leave towards the next and final stop on the canaries, Tenerife. Because I only arrived 2 days prior to the event, I was lucky to score some good days on the water and switched back to wave mode! 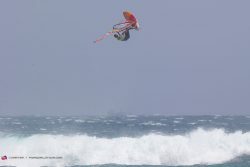 The forecast was looking good and from day 1 the competition got started in good conditions. Because of my disappointing result in Gran Canaria I was back into the Qualifying heats to make it into the main event, which is restricted to 32 riders only. With the level being super high this year I knew I needed a good heat to qualify. I managed to start of with probably one of my best waves ever at Cabezo which scored me a 9,5 out of a 10 point scale. 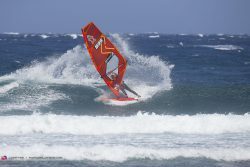 My nerves where gone and after finding a second solid wave I had earned myself a place into the main event. Because I had a low ranking coming into this event (as its only my second year on the wave tour) I faced Marcilio Brown (2013 Wave worldchampion) straight away in the first round of the single elimination, a tough drawn! Sadly enough I didn’t really came close to my level from the Qualifying heat. Marcilio was sailing amazing and ended up winning the first elimination. After enjoying the final heats of the first elimination it was time to make my comeback and work myself up to a better result. Although not a single heat is easy, I knew that I had the level to win from the guys I would be facing in the double elimination. 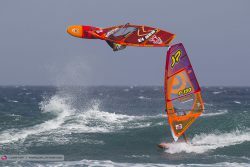 On day 3 the double elimination got started and the conditions where exactly how I wanted them! High tide, good waves and winds perfect for 4.4. With 16 minutes heats and 2 waves + 1 jump to count there was enough time for everyone to show what they could do. I knew what I had to do and what to search for in my waveriding and jumps. 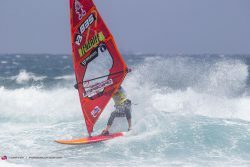 After sailing 2 consistent heats to make it into top 16 I had a hard time to find my rhythm against Jules Denel to make it into the top 10. Not knowing the scores and having a pretty bad jump counting I thought I needed a really good wave. With only 10 seconds to go I could score a set wave and managed to finish the heat with a bang! On the beach everyone almost had a heart attack and till my surprise I made it through because Jules didn’t have the best heat. Making me step into the top 10 in a wave event! My goal was more than reached and on day 4 I was up against Philip Koster (3x Wave worldchampion) to make it into the top 8. The wind picked up out of nowhere and I had to go on my smallest gear, not ideal if you want to stand a chance against the best jumper in the wave’s. I knew I didn’t stand much of a chance against Koster who was dominating. I pushed myself to go as high as possible which resulted into some good crashes! No win for me, but I came out the water with a smile on my face, my first top 10 result ever in the wave! Thanks to this result I made my way into the top 16 on the overall ranking, still very close with many other guys because of my 25th place in Pozo but a big step forward compared to last year! It feels like the training of the last years in wave paid of and I’m ready to start climbing up the ranking in the next few years. 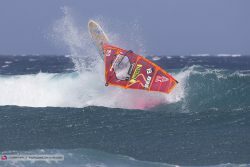 Tonight we still have the Tow-in show at the Siampark so be sure to tune in on www.pwaworldtour.com to see how far I get in this!